United In Light, is a one of kind draft horse sanctuary in Livingston that rescues the elder, abused and neglected draft horse breeds from slaughter. We allow them to live out the rest of their lives here at the ranch while facilitating equine education and therapy programs to people of all ages and from all over the world. More information at www.draftrescue.com UIL is a 501c3 Nonprofit organization and fully funded by public since 2003. “Heart Whispers” One on One Spiritual Guidance work with Deborah. Through connecting humans with rescued horses, a greater healing process occurs when this connection is utilized for the human and for the horse. It enables one to acknowledge the limiting factors or obstacles in ones life and how to utilize tools to allow you to walk more peacefully and inspired to accomplish your dreams. “Reiki I, II & Master Workshops” with the horses. 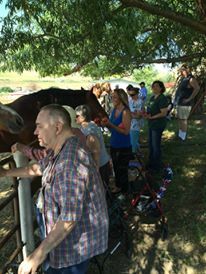 Since 2004, it has become a regular therapy to have the horses attuned to Reiki. Most of the horses are Reiki Masters, which allows them the ability to clear energy of the visitors. Most of us have issues, stresses in life and animals are such clear vessels that most of the time they end up carrying our baggage. In order to assist so many visitors the horses have joined the ranks of Reiki Master to assist visitors in their healing process as well as for the healing process of the horses. "Montana Emergency Fund" Established in August 2012, due to the Pine Creek Fires. By working with the community, Red Cross, Park County, Sheriff & Firefighters Departments and others to lend aid during an emergency situation to help owners keep their animals safe & protected. “On the Road” or “On the Ranch” programs. Traveling to introduce Draft horse breeds to the public that would not or have never had the chance to view, touch and learn about theses majestic horses. Workshops for children or groups of individuals at the ranch, which allows them to walk amongst the Gentle Giants, feeling, brushing and learning about them. “Open House for the Horses” Open Ranch Day runs all year round, rain, snow & Wind. It is held on the 1st Saturday of each month from 10am to Noon. June and July it is EVERY Saturday! It is open for all ages and all walks of life to experience these amazing gentle giants, grab a brush and give the horses some love, they will definitely love you back! No Open Shoes are allowed in the pasture! “Sponsor a Draft Horse” program. Individuals or groups can support a draft horse of their choice for a monthly donation. The donor will receive quarterly newsletters, an 8x10 Photograph, Certificate of Sponsorship and Bio of their chosen horse from United In Light. Become A Volunteer! Join the draft staff team! Their are many opportunities volunteering at United In Light. You can check out the upcoming opportunities here through signupgenius or click on the SignUpGenius image! For upcoming events go to our home page!